Location: Opposite St David's Cathedral. Opened in 1855 as the Charles Street Congregational Church. Designed by R G Thomas of Newport. 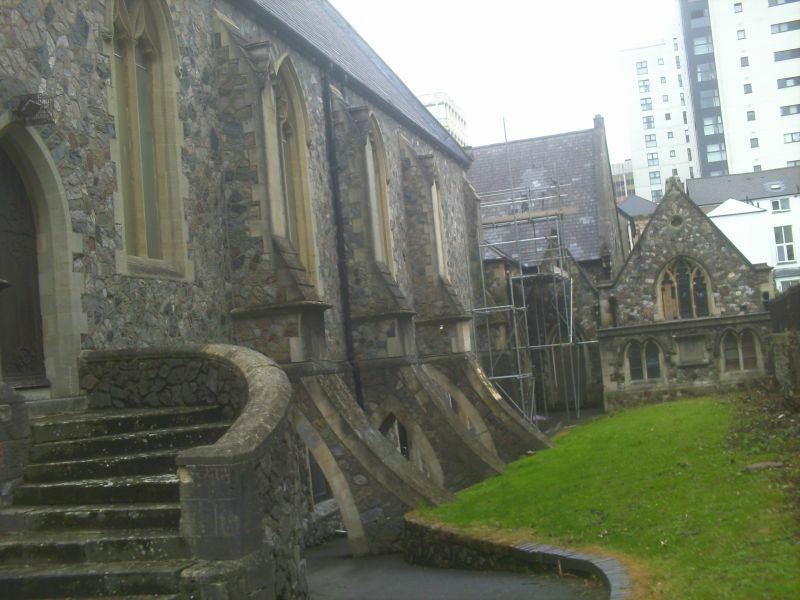 Became Ebeneser when old chapel demolished to make way for St David's shopping precinct, circa 1976, when buttresses dramatically reordered to keep wall-foot dry. The romantic story that the many coloured stonework was the result of the architect's writing to every head of state in the world for stone as a symbol of God's dominion over the whole world is less likely to be true than that the stone was imported as ballast in returning coal ships (See 'The Building Stones of Cardiff'). Gothic style church above school hall. Faced in many coloured rubble with bathstone dressings; slate roof. Main entrance to church via wide flight of steps in western elevation which has Gothic doorway with ball flower ornamentation and columns and doors with elaborate iron hinges; over the doorway, a large window of five cusped lights and circular foil; window and doorway flanked by slender full height ashlar buttresses with octagonal pinnacles with gablets. A single light window in each end bay of western elevation. A curved flight of steps rises from each side of Western light windows to doorways in sides. Nave of five bays, with porch and gallery in westernmost bay; large buttresses in side elevations of nave, pierced by arches at their base. Windows of side elevations of two-lights with daggers or foils over. Entrances to church hall also in side elevations. Interior of Church has plastered walls, a hammer-beam nave roof with scissors trusses, tall and slender chancel arch, lattice boarding to gallery front and to ground floor partition at west end of nave. West gallery supported by single cast-iron column with foliage capital. Stained glass, W window of 1855 with angels in tracery lights; "Light of the World", by W Davies & Son of Cardiff; War Memorial window by Daniells & Fricker. Attractive and early example of Gothic Revival chapel. Group value. To front and side of Chapel.